Articles in the West Australian today made me contemplate to what extend corporate responsibility should go. The argument-and hope-that private investors could finance lightrail in Perth because it would be good for their workers and hence the bottom line is an interesting one and has some merit. Staff that needs to travel less to and from work will be happier and healthier and would probably be a more productive workforce so that should be good for the employers. I read though that there is little demand for office space in the suburbs and that indicates to me that employers don’t get it or don’t care about the big picture. Decentralisation of the workforce away from the Perth CBD and the creation of so-called satellite cities should be a priority for our State Government and large employers because traffic congestion is affecting the productivity and bottom line of businesses. Fremantle is desperate for economic recovery and revitalisation but it has been near impossible to get commitment from the State and larger corporations to move staff to Freo. Sirona Capital is hamstrung with the Kings Square development because no one wants to commit to moving to Fremantle, and even substantial residential and hotel development alone will not be enough to make Fremantle the state’s second city again. We need more office workers in Fremantle and more medium to large retailers to make the port city vibrant again. There are huge development plans for the Coogee coast just south of Fremantle and somehow our retailers need to be able to tap into that potential and that requires better public transport along that southern corridor, ideally in the form of lightrail. It should also encourage businesses to open offices in Freo, close to where the workforce lives, but that has not been forthcoming and I wonder why that is. Is it more prestigious for companies to have offices in big towers in Perth than four floors in a Fremantle low to medium rise, and is the corporate image more important than looking after one’s employees and the general community? The urban sprawl in Perth cannot be allowed to continue because long commuting to work is bad for personal health, bad for traffic and bad for the environment, and it costs money so it is bad for the bottom line. It is time for big businesses to make a move to the satellites of the metro area and for quite a few of them to make the move to Fremantle, so their workers can enjoy the unique lifestyle of our city. Procrastinating in the Perth CBD and complaining about congestion and public transport is not helpful or being part of the solution. Change is required! Make the move to Freo!! One has to wonder what is going on at the WA Mainroads department and the controversial Perth Freight Link and Roe 8 highway extension. The Sunday Times reports today that although contracts have been signed with a consortium of builders the required land acquisitions for Roe 8 still have not been completed. ST also reports that the necessary amendments to the Metropolitan Region Scheme still need to be completed and might need to go through parliament for legislation. Is it a surprise the community is highly sceptical about the PFL and the whole process when this piecemeal governance is going on? It’s going to be quiet again in good old Freo with some 4,000 American sailors leaving today after four days of R&R here. The USS Bonhomme Richard, USS Preble and USS Green Bay will take part in navy exercising north of here. Thank you for visiting Fremantle and boosting the retail economy. You have been very respectful visitors to our city. 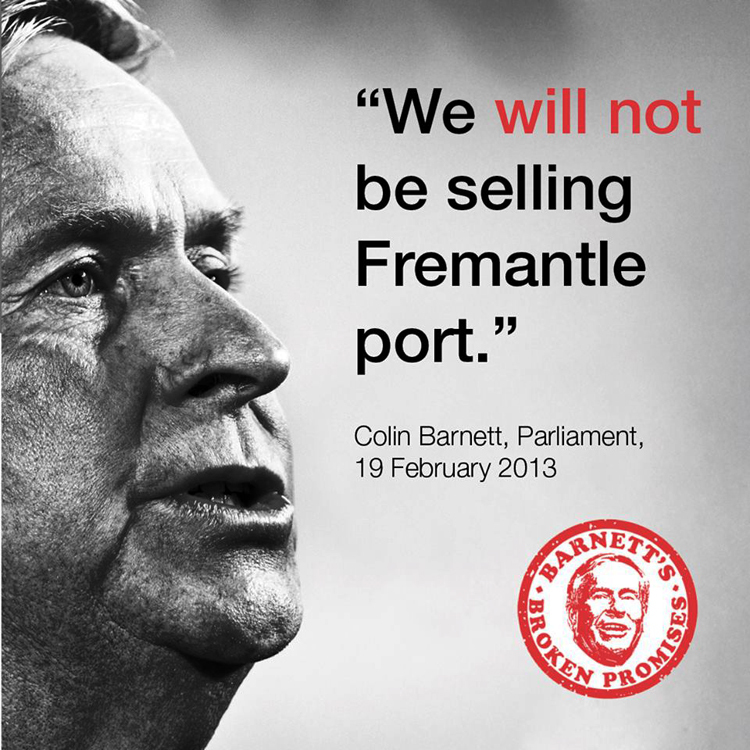 GP: Premier you announced in the Budget that you’re going to sell off, or lease, Fremantle Port. Natalie Greenham wants to know why not build a bigger port at Kwinana and ease the truck traffic through Fremantle? CB: Well to build a new port at Kwinana is probably going to cost $4 billion or $5 billion. It’s a huge expense. It will come. But it is probably not needed for another 15 years or so. So for the moment we will maximise the use of Fremantle. But yes, in 15 years or so’s time there will need to be a new port. That will probably be a privately funded port. GP: But even after that 15-year period, will Fremantle Port still continue to operate as a working container port? CB: Yes, I would expect it would. I find it very hard to accept that politicians of all colours and all parties lie to win elections and get into power or hold on to it. They always find excuses and blame another party or the economy for their change of mind and I don’t believe we should put up with it any longer. The sale of Fremantle Port and the building of the Perth Freight Link will be negative for Fremantle and the progress of our city. It is piecemeal on the hop governance that has no place in a modern and wealthy state like ours. For the past 18 months Ian and I have been working with a group of artists from Western Australia developing an arts in health project called DRAWNTOGETHER – the Art of Life. Our DRAWNTOGETHER team has been invited by UNAIDS to deliver a community arts workshop program in 2015 for people living with HIV/AIDS in Bangladesh. Please take 3 minutes to view our Pozible campaign on http://www.pozible.com/project/196613 and, if you can, please spread the word to your networks with this link to help us get to Dhaka in July. It will make a real difference where it is most needed. The Fremantle Society is very concerned about State Government’s latest plans that will further erode the power of local communities to influence or decide their destiny. Sterile sameness will be the result of taking planning approval away from local Councils. The individuality and uniqueness of suburbs and the amenity of these will gradually disappear as the development industry does it business. For example, Fremantle is not Ferndale and Cottesloe is not Cullacabardee, so why mandate the removal of the tools that help create and maintain this identity. The plans by Colin Barnett should worry all of us who believe in local government, community engagement and the essence of locality through local planning. Taking away more and more power from councils is a serious erosion of our democratic rights. We wonder what the alternative government might do about these and other so-called reforms that strip power from community. I just started to enjoy the second day of the 2010 Fremantle Festival over a cup of coffee at the Moore&Moore Cafe, when an article on page 3 of the West Australian shocked me back into reality. During a protest against the proposed asylum seeker detention centre in Northam, two women were wearing T-shirts with the slogans “Bomb Their Boats” and Sink Their Boats” That is absolutely disgraceful to me. How can anyone advocate bombing and sinking boats full of men, women and children? What an inhumane, fascist, and selfish attitude is that! One of the women, Belinda McKinnon, claims that refugees committed an illegal act when trying to enter Australia, while the fact is that under international law asylum seekers can seek refuge in any country they like. ‘Ladies’, you are inciting racial hatred. THAT is illegal in Australia. You are a disgrace to this nation. One has to question the Fremantle Gazette calling itself a community paper. Time and time again this “community” paper ignores what is going on in Fremantle. We hardly ever get reports or photos on events that happen on the weekends. I assume this has to do with the paper’s deadline and possibly because they don’t want to pay reporters and photographers to do weekend assignments. Isn’t it amazing that this “community” paper has not mentioned the success of the Concert for Pakistan, organised by a handful of committed Fremantle people and Oxfam, while our real and very supportive community paper the Fremantle Herald gave it a full page of photos, and free advertising to promote the event. It is not as if the Fremantle Gazette did not have access to photos of the concert. I emailed them four photos last Wednesday, well in time to meet the paper’s deadline. The concert raised over $ 15,000.00 by the way for the flood victims in Pakistan. It annoys me that the Gazette does not think it is important to report on things that happen in Fremantle. Thousands of people flocked to the Blessing of the Fleet on the weekend. No photos in this “community” newspaper today, while even the West Australian published a photo of it yesterday. On the other hand the Herald gives so much of free advertising to local community groups, like the Hulbert Street Sustainability Fiesta and Fremantle Chamber Orchestra, to name just a few. I know which paper I rather give my support to, and have on many occasions. I am always happy to donate my photos to the Fremantle Herald, to support my local community, because that is what they do as well. The sentiment is in the word community. Maybe someone at the Gazette can look it up in a dictionary.